Growing up with a photographer/videographer father and hair stylist/craft artist mother, both who had deep roots and aspirations, has fueled Jon’s artistic creativity for as long as he can remember. Jon became more fascinated with the arts during his childhood years. He fell in love with all types of media/visual arts, such as photography, video editing, cinematography, acting and painting in different times and places. Throughout his Deaf childhood, he has remained passionately devoted to educating Deaf people about the linguistic, social, political and cultural issues of the Deaf community by traveling across the states and countries. Late 2011, his desires and aspirations to be an artist were once again fueled. He began creating pop art paintings based on people and classical subjects that inspired him by using abstract, bright colors and clean cut painting style. Currently he is using his paintings/photographs as life stories that are reflected in his visual journey. 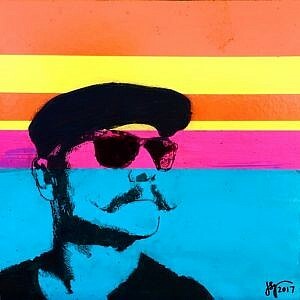 My artworks take a critical view of blending pop art and classical subjects. In my work, I deconstruct the classical subjects that are a part of my childhood and adult cultures. By incorporating a positive vibe, my work reproduces familiar classical subjects by arranging them into contemporary art. Often times these themes are combined into installations that feature stripes as abstract bases on sunrises/sunsets with different color temperatures. The color scheme of a sunrise/sunset establishes a good morning or good night, suggests the notion of good vibe, and formally unifies the disparate objects in each installation. The artworks provide clues to interpret the content. Each project often consists of multiple works, often in a range of different media, grouped around specific themes and meanings. During research and productions, new areas of interest arise and lead to a positive feeling.